For over 92 years, the Alessi family has prided themselves on the consistency of each bakery product they offer. They choose the finest ingredients available, from farm fresh eggs and milk, to the freshest hand selected fruits and nuts. 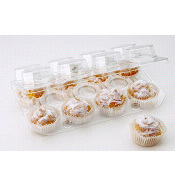 Alessi Bakeries offers a wide variety of fancy desserts. 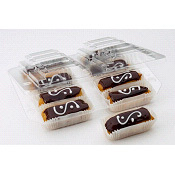 Elegant Foods favorites include their Mini Custard Eclairs and Mini Cream Puffs. These alone are worth hosting the Alessi line of high-end baked goods. Four varieties including: Key lime, Cookies n’ Cream, Raspberry and Tiramisu. 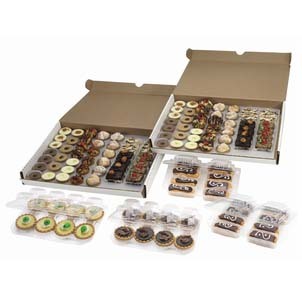 Mini cheese cakes in eight flavors: Mocha, Orange, Chocolate Chip, Butterfinger, Brownie, Amaretto, Key Lime and Chocolate. A wonderful combination of seven flavors, perfect for any occasion. Eight of each per carton, Italian rum, Hazelnut, Carrot Cake, Double Fudge, German Chocolate, Chocolate Mousse and Chocolate Macaroon. A combination of fondant, dark chocolate decoration, Frangipan cake and European raspberry jam make these Petit Fours stand out. 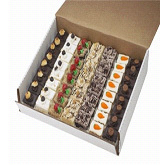 Petit Fours come in four pastel colors: white, pink, yellow and green. Alessi's world class cream puffs are a memorable experience for even the most sophisticated palate. 20 eight packs per case. Alessi's world class eclairs are a memorable experience for even the most sophisticated palate. 20 eight packs per case. 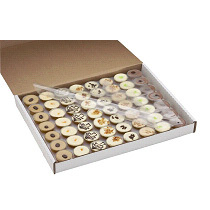 An assortment of miniature pastries, 32 mini assorted cheesecakes, 24 mini assorted pastries, 16 petit fours, 16 mini cream puffs, 16 mini eclairs and 16 mini tartlets.